Lucky resting and relaxing after her surgery. "Lucky originally became homeless after her elderly owner was admitted into a nursing home. 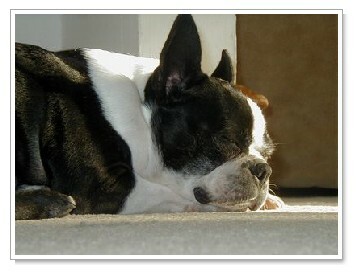 She was then passed thru another home or two before she came to Northeast Boston Terrier Rescue. None of this seemed to alter her wonderful personality. She soon became part of one of our foster homes and earned the love of all who met her. She made herself right at home and greeted everyone with enthusiasm. She is a very special girl who soon got the nickname, The Princess. She most definitely was a Royal in her former life. After a few weeks at her foster home she began to limp. After a visit with the vet it was discovered she had 2 grade 4 luxating patellas. ( bad knees) A second opinion said exactly the same. The Vet said she had been living in constant pain most of her life and she would only get worse as time went on. It was decided that surgery was needed. With the help of other volunteers she was transferred to Massachusetts to be closer to a vet who did a wonderful job. A week later she was back to her foster home for rest and rehab. A month later she was lounging in the sun in her new forever home. She now lives in Woodstock New York with a retired couple who treats her like the Princess she is. With the help of other volunteers she was transferred to Massachusetts to be closer to a vet who did a wonderful job. Once again NEBTR is indebted to the help of Vicki Kennedy of Kennedy Bostons and her vet, Dr. Vinny, for helping us help Lucky." "Makayla was rescued from a Lancaster Co. puppy mill in November 2007. She was fostered by Tammy T, and two days before Christmas she came home to us. She is doing very well here and has become best friends with her big Boston sister Sabbie and foster sisters Mum Mum and Gracie. Makayla likes to spend her time sunning in the front window and wrestling with the other girls. She loves to eat chicken meat loaf and yogurt." eye drops for the rest of his life. He spent Christmas and New Year’s with his foster parents and that is about the time they realized their household consisted of TWO Boston Terriers. He just had the best personality that fit their household and got along so well with their other three year old Boston Terrier that they couldn’t let him go. He is about to celebrate his first birthday and his past rough life is a distant memory. Happy Birthday Chancers!!" Say Hello to Mason - The smiling Boston ! Mason was surrendered with his sister because his family did not have any time to spend with them due to business. Mason is now living like a king in NJ and has never lost his wonderful smile. Addie was rescued from the CACC in Brooklyn, having been found as a stray. Addie had cherry eye in both eyes, kennel cough and was underweight. We had the Vet correct her eyes, her kennel cough disappeared and within 2 weeks she was playing hard with other fosters. Addie now lives on Long Island with the company of a Dauchsie. Meet Joe - a special needs rescue. Joe is deaf. He was rescued by Ohio Boston Rescue and transported to NY for adoption. Joe is now fluent in doggie sign language and lives on Long Island with 5 other Bostons in the home of one of NEBTR's Directors. Being deaf does not hold this dog down. Please consider special needs dogs when looking to adopt ! This attractive fellow is Champ. Champ was abused by his former owners. His jaw was broken and never set, so his tongue hangs out of his mouth. His new owners report this just adds to his wonderful personality! Champ now has a caring wonderful family who love him and his flaws. Photo was supplied by his new family. Buster was rescued from a Long Island Shelter in 4/05. He was sick with a respiratory infection and extremely thin - not very desirable. His foster parents took him in to help him regain his health and figure. After a week they realized that Buster was already in his forever home and they would never let him go. Buster is now a happy, healthy 35 lb. Boston living in New York City.